There are many fun and exciting Caribbean cruises that are available to meet just about any budget. Whether you are enjoying one of the cruises to Aruba from Florida or any of the other wonderful cruises, you are sure to have an amazing time. While researching for the best Caribbean cruises, you will find many choices such as Royal Caribbean, Princess and Carnival, just to name a few. It’s important to comparison shop for the best Caribbean cruises. If you are a family looking for a cruise, be sure to find cruise lines that offer many things for your children to do. Here, we have compiled a list of the 7 best Caribbean cruises for families. 1. 5 Night Western Caribbean Cruise by Royal Caribbean – This is a great cruise for families. There are many fun things to do while aboard the ship such as a surf park, boxing ring and a waterpark complete with a ground geysers. For about $349 per person, guests will visit the ports of Labadee, Haiti and Falmouth, Jamaica after leaving Ft. Lauderdale making this one of the best Western Caribbean cruises. 2. 6 Night Western Caribbean Cruise by Carnival – For about $309 per person, guests will depart Ft. Lauderdale before sailing to Key West, FL, Georgetown, Cayman Islands and Ocho Rios Jamaica. 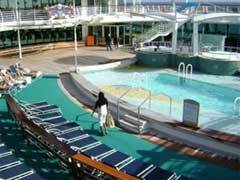 Onboard the ship, families can enjoy waterslides, video arcades as well as outdoor movie screens. 3. 7 Day Disney Western Caribbean Cruise – Disney is known for its atmosphere designed for families with children. There are many fun things to do such as visiting with the Disney characters, enjoy shows and movies as well as creating animated art. For about $1000 per person, guests will enjoy Key West, Grand Cayman, Cozumel, Mexico and Castaway Cay. This is definitely one of the best Caribbean cruises for families. 4. 6 Night Western Caribbean by Royal Caribbean – For about $420 per person, guests will have access to the rock climbing wall, basketball court, ice skating rink and inline skate track. Guests will also enjoy the ports of Georgetown, Grand Cayman, Ocho Rios, Jamaica and Cococay, Bahamas. 5. 7 Night Eastern Caribbean Cruises by Princess Cruise Lines – For about $500 per person, guests will enjoy ports such as St. Maarten and St. Lucia. While aboard families will enjoy backstage tours, teen center, movies, science experiments and hot tub parties. 6. 7 Night Western Caribbean Cruise by Norwegian Cruise Lines – For about $400 per person, guests will enjoy the ports of Great Stirrup Cay, Bahamas, Ocho Rios, Jamaica, Georgetown, Grand Cayman and Cozumel, Mexico. While aboard, guests will enjoy bowling alleys, teen clubs, arcade and an indoor and outdoor play area. 7. 7 Day Caribbean Cruise by Crystal – While aboard these luxury ships, guests will enjoy the wonderful amenities such as fitness center and spa, massages, five star restaurants, shopping. Activities for families include a scavenger hunt, pool parties, arts and crafts and PlayStation games. These cruises are a little more expensive than some of the others but are well worth the price. It’s clear to see that when planning your Cayman Islands cruise, there are many choices. Whichever you choose, you are sure to have a wonderful vacation.